Preconditions: What are they for? As it was explained in the previous article, every mission is a graph consisting of connected decision points, which we also call, “steps.” Preconditions of a step are responsible for checking whether you, the player, can see the step or not. 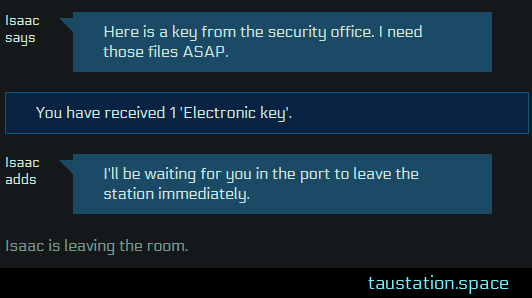 Steps define, for example, in what location the mission can be continued, what reputation your character should have with the local authorities (not necessary good, by the way), whether the character has high enough personal stats, etc. The list of implemented preconditions is not final yet, and we are continually adding new preconditions into Mission Builder, which means even more sophisticated choices will be available soon. Without saying much, your previous mission decisions will be taken in account, so even if two branches of the story joined into a one at some point, you may find a different set of later options available as a result. So be careful with your choices – choosing the easy path might lead your character into a trouble later. 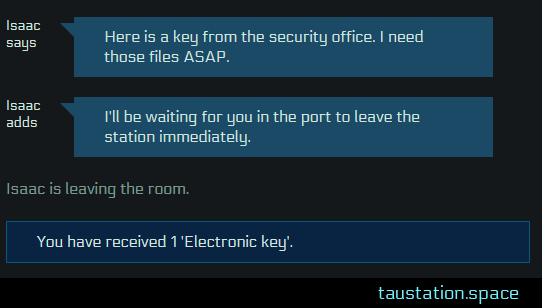 As was previously mentioned, missions in Tau Station are not just stories, they leave a lot of space for the player’s decisions. Whereas the preconditions are “Yes/No” settings, actions bring elements of randomness into the mission progress. But having just simple chance settings would be too easy, right? So we added even more types of actions where your character’s properties, such as reputation, stats, and so on, can help to improve or decrease the chances your character has to pass the step with a chosen action. Thus, while every action has a “difficulty” setting, advanced characteristics of your character will allow you to progress in the missions faster. Character properties have influence on other aspects of gameplay as well, apart from “difficulty,” e.g. the number of tries you can attempt an action before becoming exhausted and needing to refresh your stats. Every action attempt taxes one or more of your character’s primary stats: strength, agility, stamina, intelligence, social, and focus. The better the stats, the bigger the number of attempts for the action. So don’t forget to visit the Gym before starting your next mission! We had somewhat bigger missions, but not significantly. And nobody expected that our missions would ever have more than 20-40 steps. When our intention refocused on creating missions that grant players more agency and choice, the initial design no longer met our requirements. The Mission Builder was made more robust, and we are constantly enhancing it to make sure it corresponds with our needs. As was mentioned before, actions have difficulty settings. From the beginning the difficulties were absolute, for example: strength [7;15] meant that only characters with a strength higher than 7 were able to successfully pass the action, and if the strength requirement was higher than 15, it was almost guaranteed that the action would be passed. Almost, because there was always a small chance for a critical failure. That sounded flexible enough until the narrative designers started to ask, “I’m developing a mission for level 3 players. What difficulty settings should I enter to make it an average action/challenge?” We had no clear answer as we didn’t have a production database yet to help us with this decision. As a result, it was decided that we should move from absolute values in difficulty settings to relative, and convert the latter into absolute values “on the fly,” using the mission configuration and in-game statistics. Now, the difficulty levels setting is a simple choice from: “Very Easy, Average” to “Very Hard.” The narrative designers are able to choose the difficulty setting that best fits, according to the mission scenario, and they don’t have to think about any abstract numbers. This makes our action configuration much more flexible and maintainable. For example, if we decide that the amount of difficulty levels are not enough, we’ll just add one more into the configuration. The first version of the mission action challenges didn’t have any outcomes for a failure except stat cost and not passing the step. That didn’t allow us to make actions as “dangerous” or “impactful” as they ought to be according to our plans. Now, any supported outcome is possible when an action’s test is failed. Take some credits for each attempt? – Possible. Toss the character into the brig? – No problem. Decrease reputation level? – Sure. We also changed the internal mission structure, letting the narrative designers decide in which order outcomes are applied instead of having of predefined order. In the span of a year we have developed and refined a wide collection of missions to provide SciFi fans with an array of choices and outcomes through our immersive engine. From the seemingly basic, to the vast and complex, every step you take defines the life you are developing within Tau Station universe. With paths as unique as our players, our game offers something for everyone. We’re working hard to make all of that amazing content available for playing. 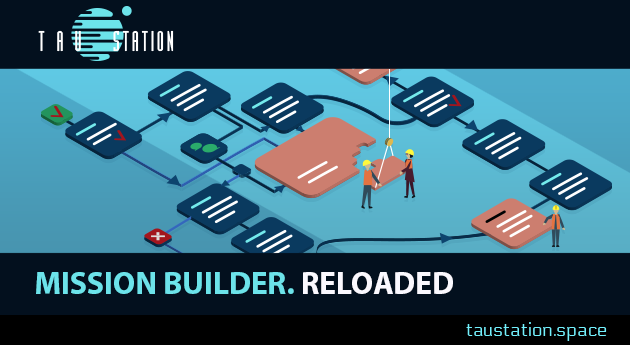 With bones shaped by the technical team, an outward appearance molded by the User Interface team, and a mind shaped by the writers, we at Tau Station thrive together as a carefully crafted body of unity. We are intertwined and dependent on the health and stability of each other. As a unit, we are committed to providing the highest grade of content to you, the player, our heart. 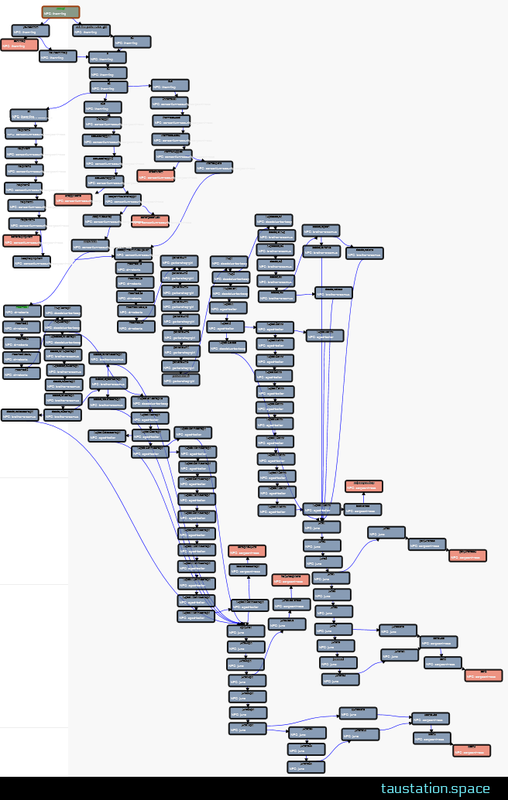 Through the use of the Mission Builder, we writers are honored with the task of creating adaptive narratives: stories that react to you like the branches of a tree. Just as no two people are alike, so too should no two experiences be precisely the same. Through variation of gameplay possibilities, you have a multitude of opportunities to choose your path of progression through the story. The approaches offered range from the cautious use of intelligence and subterfuge, to use of aggressive strength and brute force, with every choice like a note composing a song along the way. We strive to provide gamers with the agency of choice in our universe. In the vast expanse of space, the possibilities are endless. Who you will be and where you will go, in a living, breathing universe of other players, is in your hands. The backdrop of your journey will be painted by the writers on the canvas of the Mission Builder to bring your experience to life. It is a delicate and massive undertaking, but it is one which we are honored to do.